Are you looking for backyard ideas where you can entertain friends and family, but unable to afford it? What if someone told you that there are many cheap and easy ideas to help you get a backyard that is perfect for all your entertaining needs? You will be surprised by just how much you can do to transform your backyard into a beautiful space where you can have loads of fun with friends and family. Get Solar Lights: Do you have an old chandelier that you do not use? Do not be so quick to get rid of it just yet. You can use it to decorate your outdoor space and add light and beauty. Replace the old light bulbs in the chandelier with solar lights. Solar lights are fantastic as they are inexpensive and also help you save money in the long run as you do not have to use electricity. Hang it from a tree branch and get a gorgeous decorative item that provides outdoor lighting and magical charm to your backyard ideas. Play Glow Games: Do you and your family love to spend time playing outdoors? Well, you do not have to limit those to the day. Get glow bracelets and necklaces and play fun rounds of ring toss at night. This is a poignant way to have a bit of fun with your kids and the glowing neon bracelets and necklaces looks super-cool and add more to the fun! Tie Vases to Your Fence: Are you planning an outdoor party but not sure what to do about the plain-looking fences? Do not think about doing anything too drastic and expensive. A simple yet gorgeous idea is to tie vases to your fences and fill them with flowers or plants. If you do not have vases, you can use old glass bottles too. 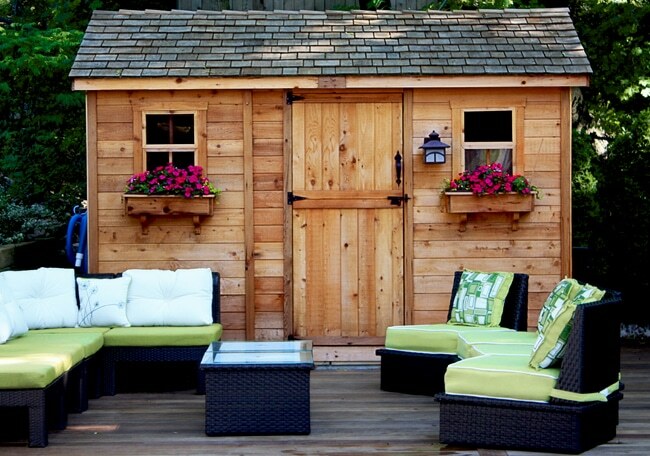 They will add loads of charm to your backyard space and you can be sure that your guests will adore your decorating idea. Spray Paint Metal Folding Chairs: Are you panicking because you have nothing but old metal folding chairs for your outdoor party? Relax! There is a super-quick and easy solution. Just spray paint the folding in bright, vibrant colors and transform them into pretty chairs for your backyard party. Everyone has several of these chairs lying around in the garage or basement, but are hardly used because they are considered quite ugly. But now you can beautify them with some spray paint and have some bright, funky-looking folding chairs. No doubt your guests will ask where you got them from! Get a Splash Pad: Want a swimming pool, but cannot afford one? What is the next best thing? A splash pad! They cost a few thousands, but that is still much cheaper than getting a pool. Plus, they are much safer as there is no risk of drowning. Splash pads are loads of fun for kids and adults alike. If you want to entertain on a warm, sunny day, this is the perfect solution. You can bet that everyone will love your idea and start getting splash pads for their own homes. Make Mosquito-Repellant Tiki Torches: Do you need outdoor lighting for your backyard party? No problem. Just make a couple of DIY tiki torches that work as mosquito repellants as well. All you need is old wine bottles, citronella oil and thick wicks. They will look great at night and keep your guests safe from irritating mosquitoes so that they can have fun without getting bitten. If you have old wine bottles, keep several aside as you will find many ways to reuse them around your home. Use Glow-in-the-Dark Paint for Outdoor Lighting: Other backyard ideas are to get some neat lighting for your outdoor space. Coat a few planters around your backyard with glow-in-the-dark paint and you have instant lighting for those nights you are entertaining. They are safe, help you save money, and look amazing. You will love the effects the paint gives off at night, and so will everyone at your party. Use Mirrors to Make Your Yard Look Bigger: Is your backyard slightly on the smallish side? Well, not to worry because all you need is an illusion to make it look bigger, especially when you are planning to have friends over. A magnificent trick is to hang mirrors on your fence to make your yard look more spacious than it actually is. Use old windows as frames for the mirrors and you will have a unique and beautiful way to do up your fence while creating an illusion of a bigger yard. As you can see, there are many simple and cheap ways to get the backyard, you want, especially if you are planning to entertain loved ones. Forget about spending a fortune on giving your backyard a makeover – just get creative and use your imagination to create the perfect backyard for parties and get-togethers with friends and family.